Anti-Slip FRP Stair Nosing 600x76mm Width is tested to comply with AS 4586:2013. 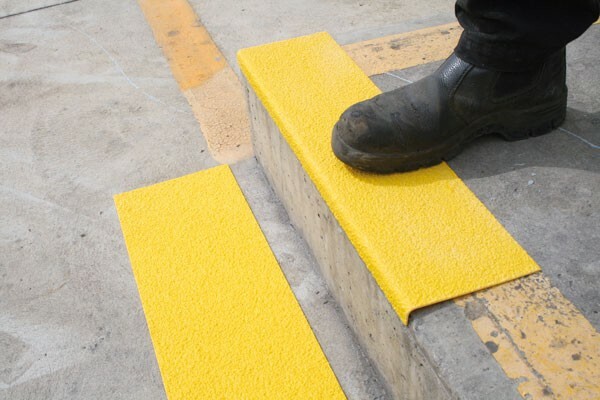 It is constructed from fibreglass composite with integrated anti-slip grit in yellow. It is mechanically fixed or adhered installation. The anti-slip fibreglass material will not corrode or delaminate and is dimensionally stable in all temperatures. It is highly resistant to chemical attack and is available in a wide range of sizes that can be cut to desired length. Anti-Slip Floor Plates are also available in a variety of sizes. Be the first to review “Anti-Slip FRP Stair Nosing 600x76mm” Click here to cancel reply.